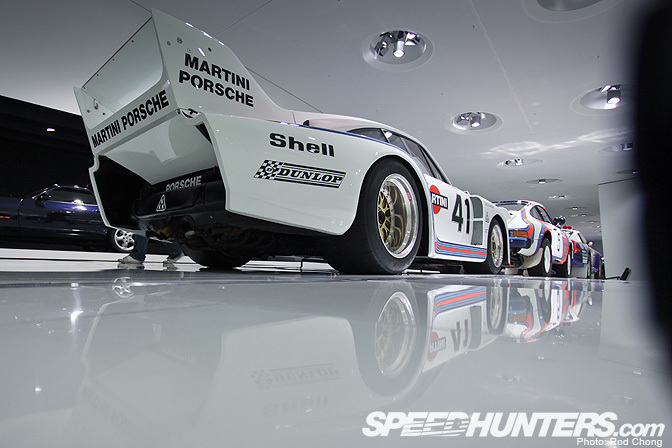 Ok let's continues on with our tour of the Porsche Museum. We've already shown you the restoration workshop and the start of the main exhibition, and now we'll walk through to the finish of the displays. Our first stop packs quite the punch with a 917K being flanked by Hans Herrmann's #64 Porsche 908. 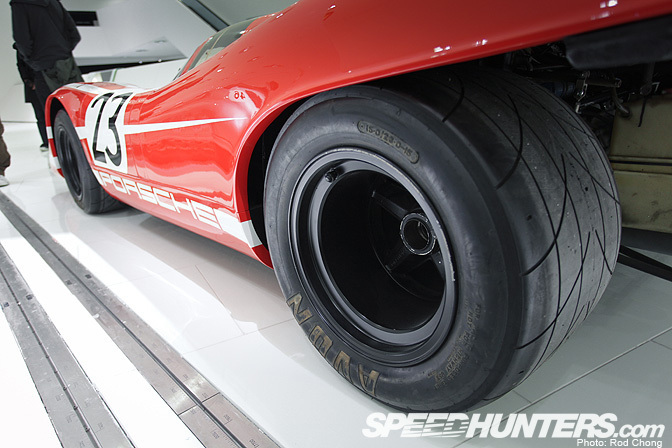 This car is famous for coming second at Le Mans in 1969 to Jacky Ickx's Ford GT40 by a mere 120 meters. Is that enough dish for you? An interesting fact, for any train-spotters in our audience, is that this chassis is not the actually 1970 Le Mans winning 917K chassis. It's a replica. 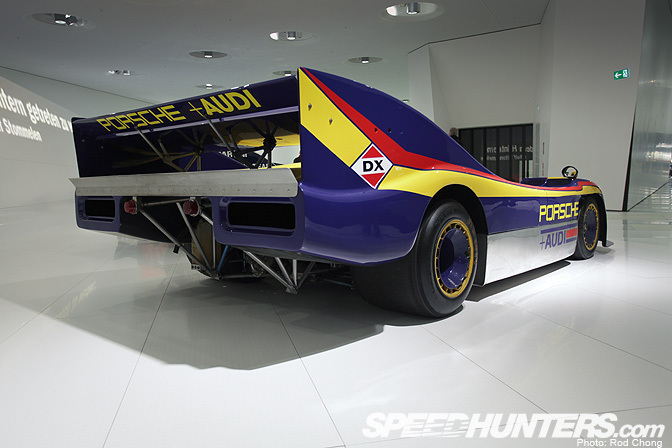 Here's a 1981 924 GTP Le Mans, which is actually a 944 prototype in disguise. Porsche decided to enter the pre-production based car in the 1981 Le Mans 24Hs more as a grueling road test than anything else. The car's seventh place overall result far exceeded anyone's expectations. There's nothing more beautiful than an original RS 2.7. Interestingly we shot this very chassis back in 2008, at Porsche's Leizig test track. 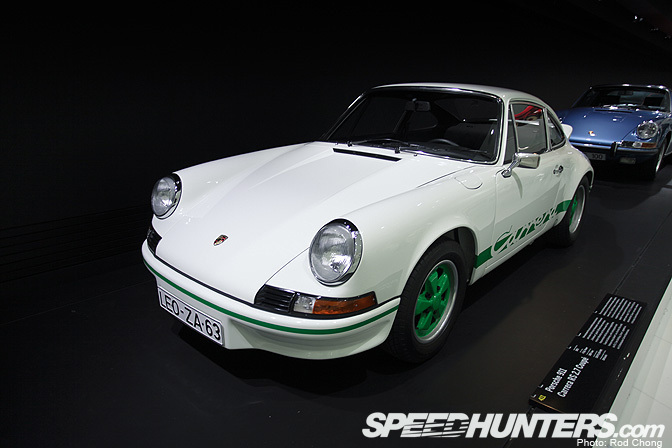 At the time it was a fresh restoration on route to its new home at the Porsche Museum. Funny that! 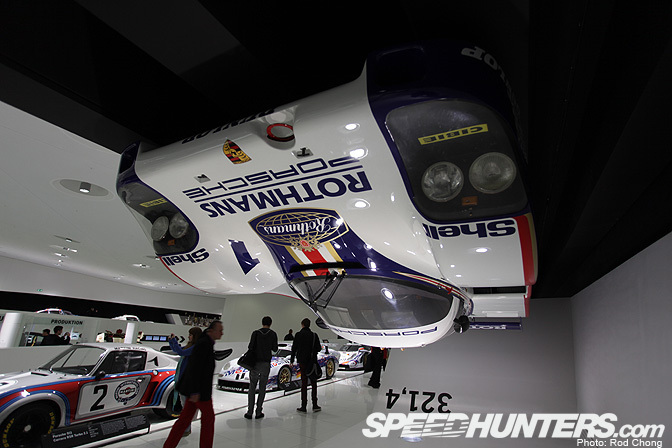 No your eyes are not playing tricks, this Porsche 956 is actually mounted to the ceiling. 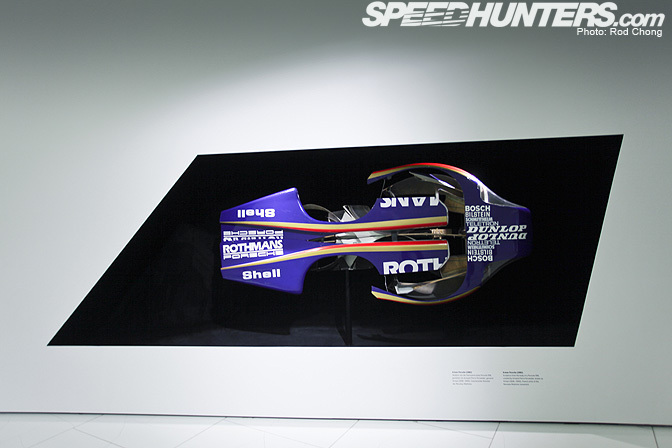 The intent was to show that it develops enough downforce, over speeds of 321 kph, to theoretically drive upside down. Ahh here's where things start to get really interesting. 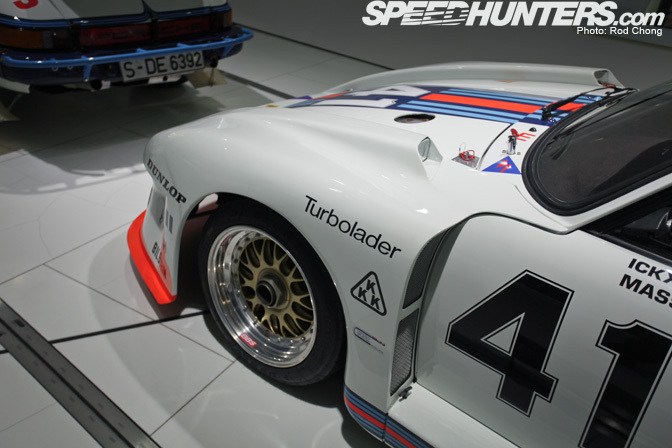 This is the legendary 911 Carrera RSR Turbo 2.1, the first 911 to utilize turbo technology. This particular example took second place at Le Mans in 1974, which is a mean feat for a production based car. Ahh it's so good… Let's just take a moment to appreciate this car together shall we? Inhale, exhale, inhale, exhaust… and… we're back…. 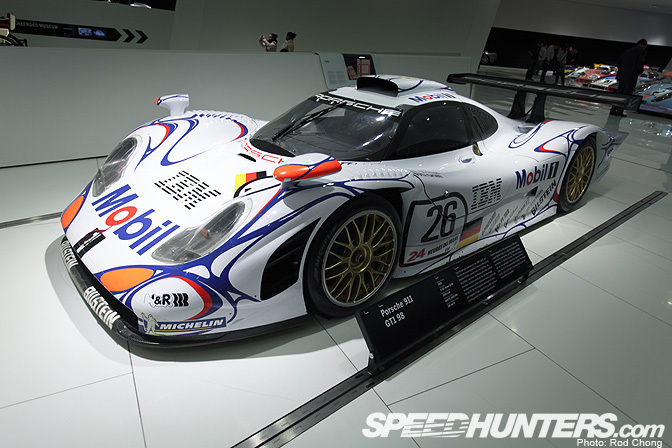 Yes this is the 1996 version of the 911 GT1. It was a bit of a controversial car at the time, as it raised questions as to what was a street derived race car and what was a race car derived for the streets. 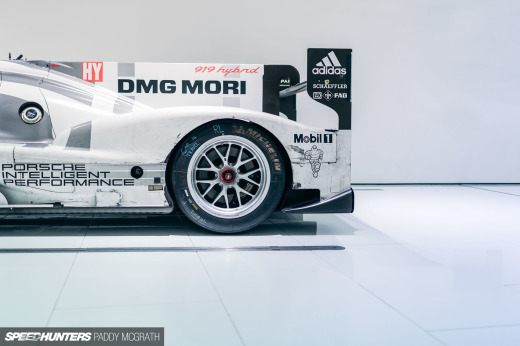 Two years later and the 911 GT1-98 was looking more like a full-on prototype. 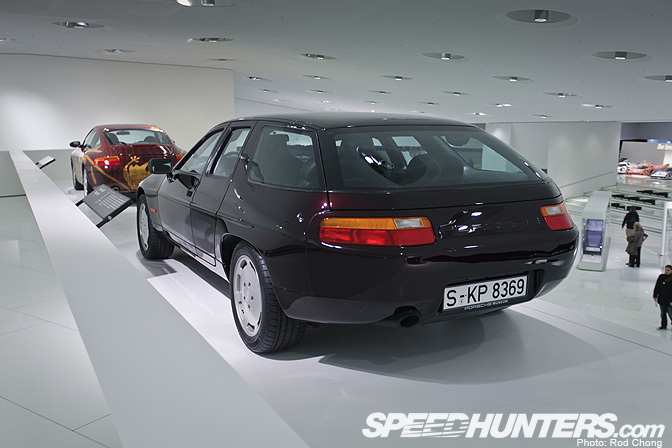 Here's an early prototype of the 924. You can see many elements here which didn't make the production version. Interesting! Ahhh… and now we start reaching more of the modern era of Porsches. 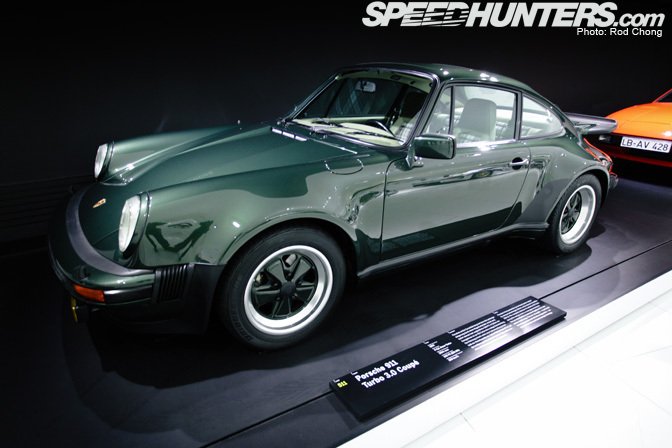 I'm sure that this is the car that's been the making of many a lifelong Porsche connoisseur – the 930 turbo. Are you still with me here? By this stage I was getting weak at the knees -being surrounded by so much automotive goodness. 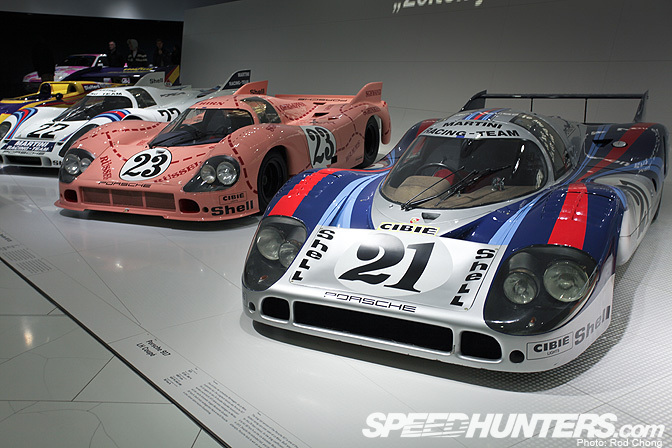 But this line up of legendary 917s was almost too much to take in at once. 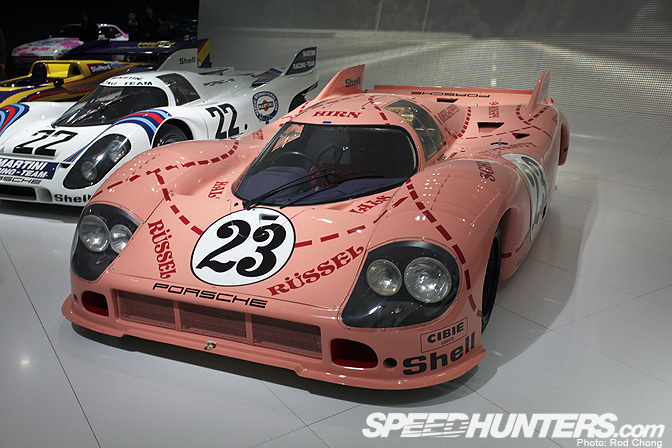 I took a few moments to eyeball the less celebrated 917LH long tail and Pink Pig 917/20 versions of the car. 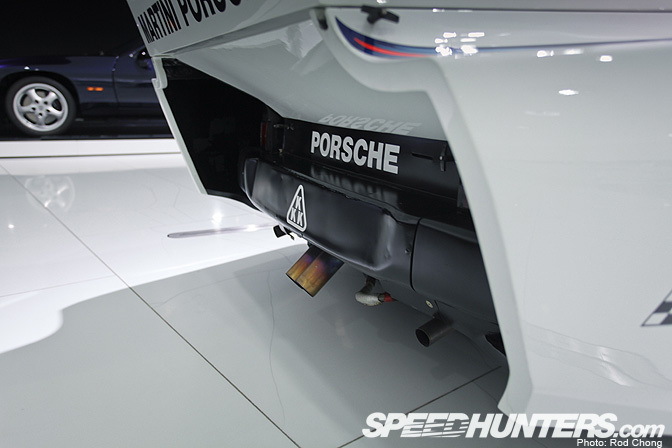 The LH version was Porsche's attempt to go for maximum top speed at Le Mans, with the slippery long tail body allowing the car to reach dizzying velocities of 250mph on the Mulsanne straight. Remember this was 1971 no less! The drivers must have been truly terrified. Some of you will know that the Pink Pig was the subject of a recent feature in Motorsport magazine. Having now seen the car in the flesh, I can safely report that it is an odd looking car and certainly deserves its piggy pink livery. 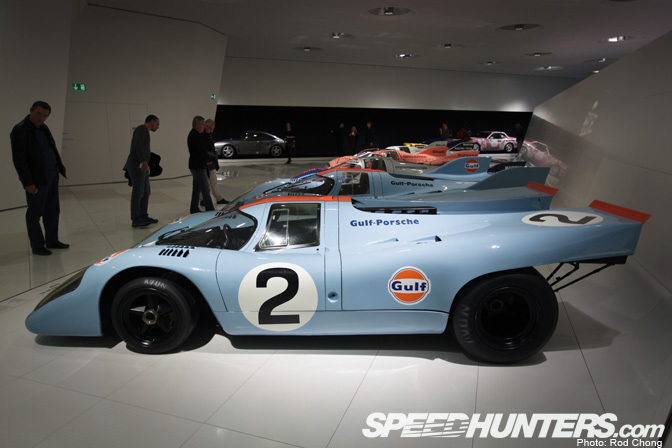 Oh yes we like… we like very, very much: the legendary Porsche 917/30 Can Am racer. The performance figures of this car are staggering: 0-60 mph in 1.9 seconds, 0-100 mph in 3.9 seconds, 0-200 mph in 10.9 seconds, and a top speed of 257 mph. With a potential 1300 bhp on tap in qualifying trim, it's said this car could smoke its rear tires in 5th gear… I'll let you chew on that fact! The automotive hits keep on coming! 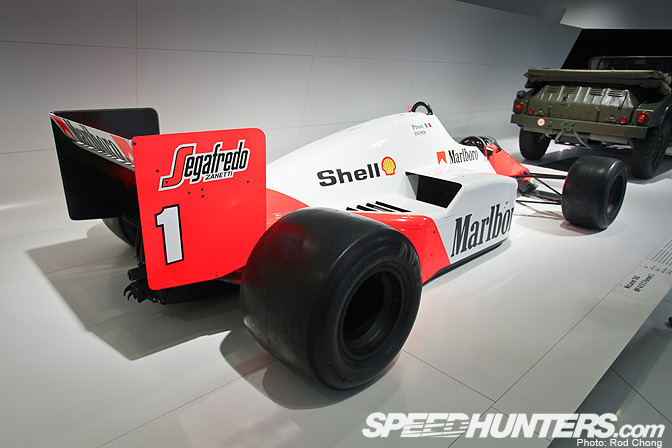 This is a 1986 McLaren MP4/2C which you may recall was powered by the TAG Porsche six cylinder turbo engine. 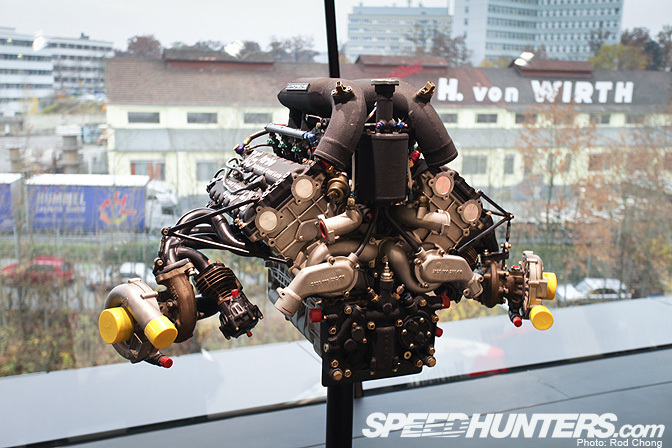 And here's the engine itself complete with turbo setup. OK let's try and calm down a bit here with a shot of a more humble 1981 924 Carrera GTS, one of only 59 in existence. 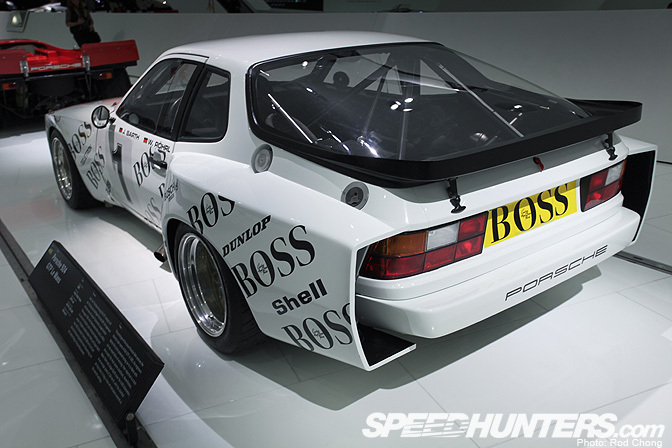 This basically was a road legal version of Porsche's 924 club racer. Oh yes…. I don't think this machine needs any introduction. I will point you though to a retrospective article I wrote about this car a few years back. 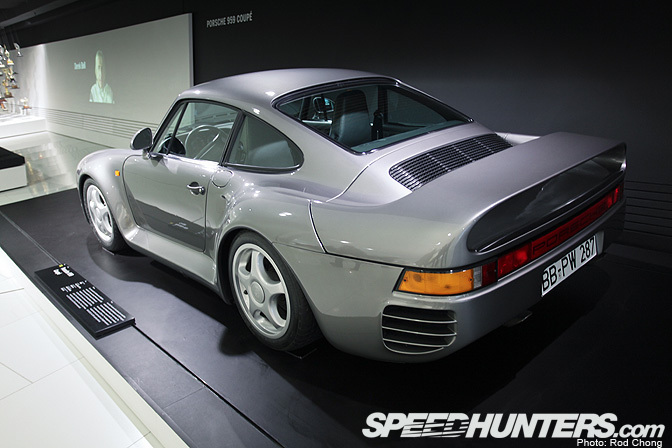 Have a look to learn more about the 959 project. 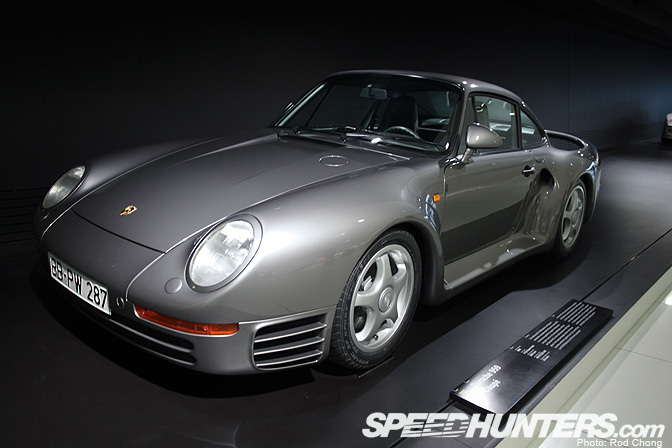 If you read the article then you will no doubt be familiar with the 959's exploits on the Paris-Dakar Rally, winning the 1986 running of the event with this particular chassis. I was a little disappointed that the 935-78 Moby D-i-c-k (sorry I have to spell the word like that to avoid our auto-censorship system) was not on display for my visit. Long have I wanted to see this car. 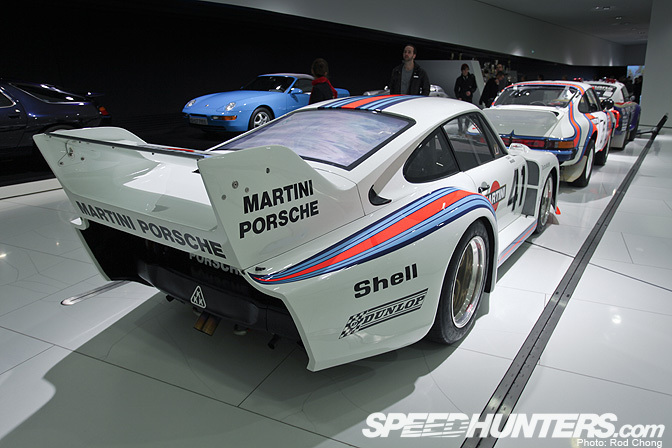 But I was quite ecstatic none-the-less to see the 1977 version of the 935, aptly named the 935-77. 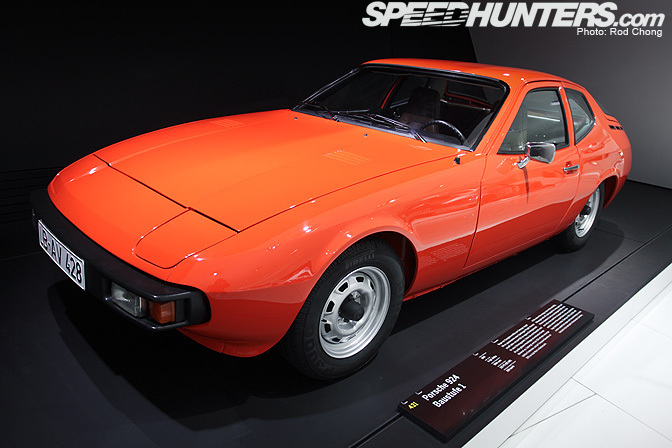 This example would have been used for Porsche's assault on the 1977 version of the World Sport Car Championship, then called the World Championship for Makes. 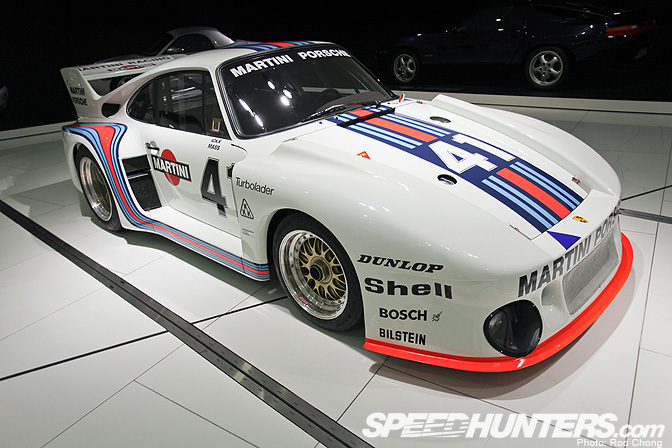 Martini Porsche easily dominated the proceedings, with wins at Mugello, Silverstone, Watkins Glen and Brands Hatch, thus cementing the 935's reputation as being practically unbeatable in the Group5 category. Note the rear view mirrors integrated into the body work. 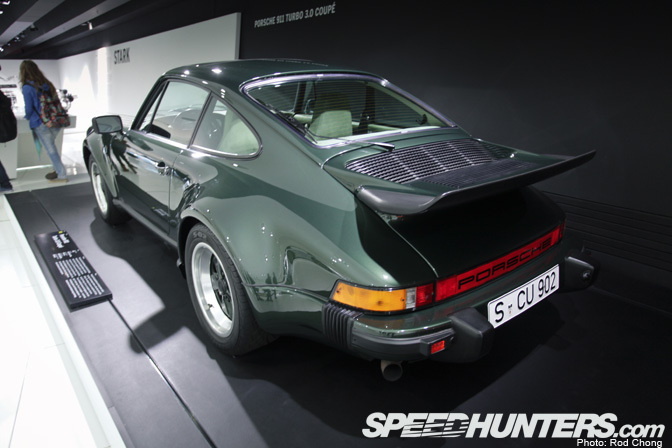 I dream one day to have a full carbon fiber street based 930 inspired by this machine. … but it's perhaps best that we keep moving. Next up we have two recent Porsche supercars. 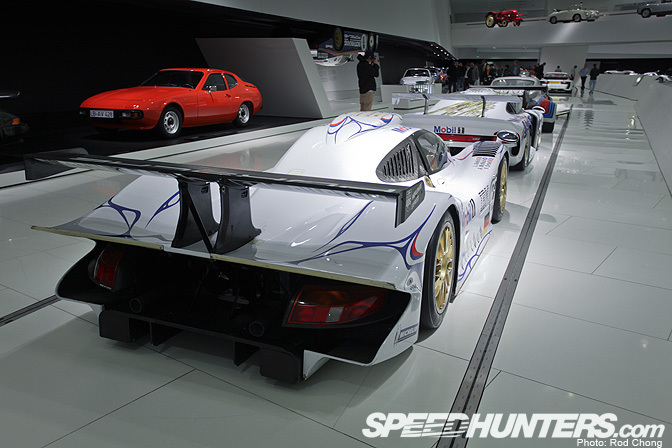 The 1997 911 GT1 Evo street car and a more recent V10 powered Carrera GT. Here you can appreciate the evolution of the 911: from right to left: the 964, 993, 996 and 997. 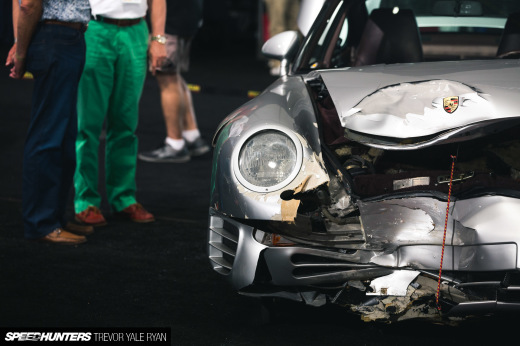 It's interesting to see how tame the 993 based turbo looks compared to Rauh Welt's reinvention of this chassis. 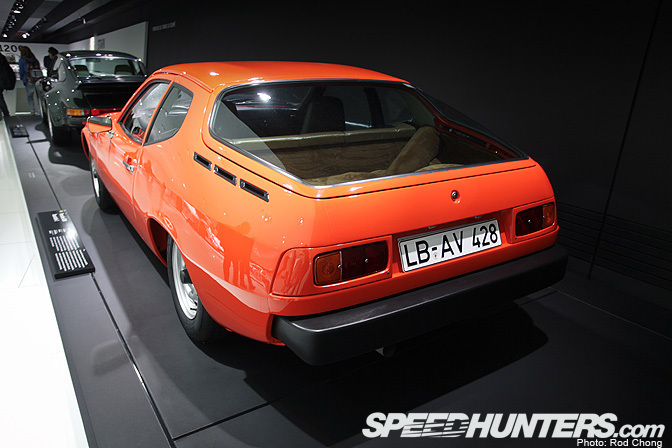 It wasn't that long ago that this was Porsche's flagship performance car. Here's an interesting wall display. 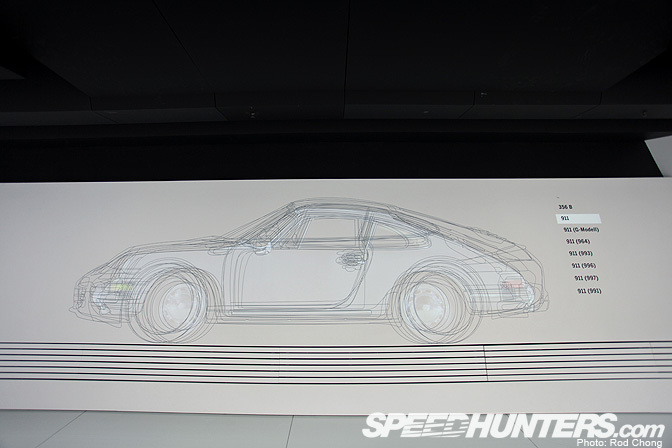 Scale line drawings of each iteration of the 911 are superimposed together, allowing you to see the development of the car's silhouette from the original 356 through to the incoming 991 model. 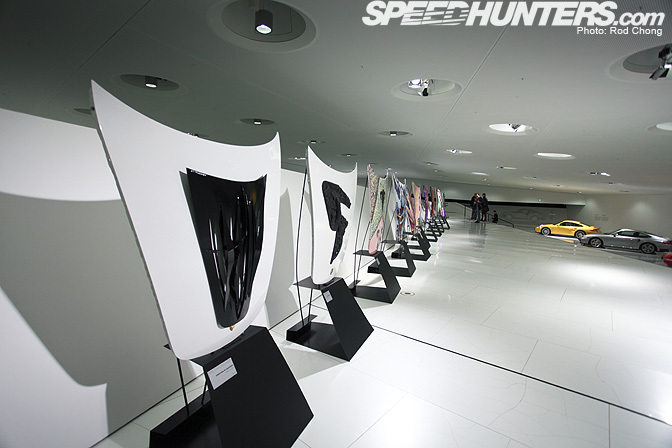 You can just see a side view of the original 911 being projected over the line drawings in this shot. Gradually this image project is replaced by each incoming 911 evolution, through to the present day model. It's an interesting view both to see how much respect the 911 pays to its heritage, and how cars just keep increasing in size. 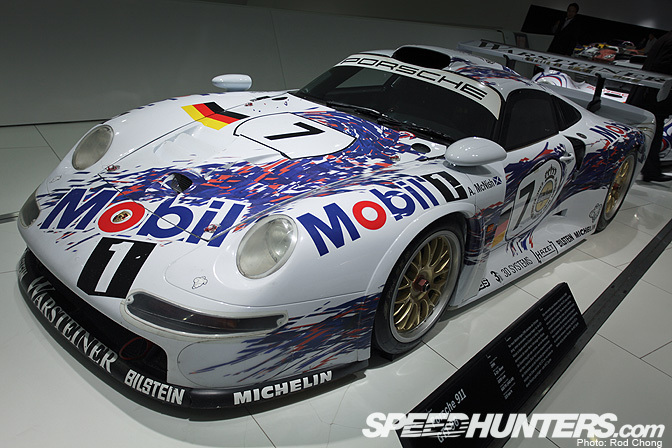 The top level of the museum is reserved for special exhibitions in this case the “Colección Goméz – Porsche and art” show which is running until January 8th, 2012. 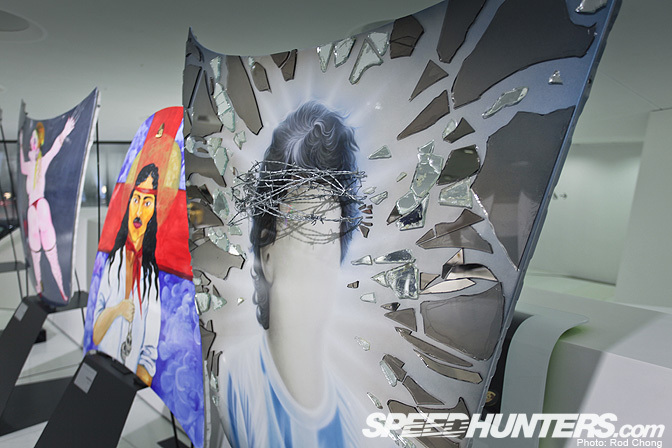 19 artists from Uruguay and Argentina, were invited to paint on a series of Porsche GT2 bonnets, transforming each piece into a work of art. 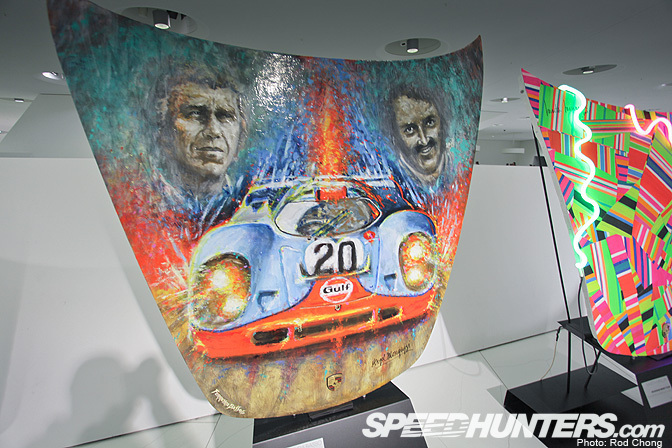 … while others paid homage to the legend of the 917. 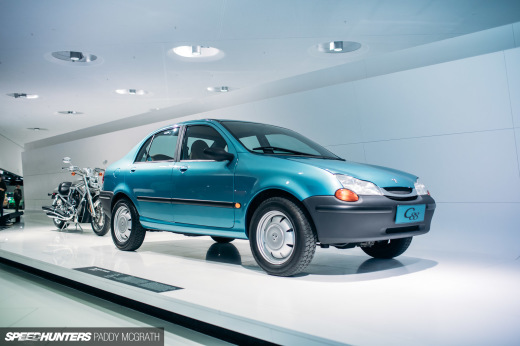 All in all, it was a refreshing intersection of the automobile with contemporary art. … as well as sculpture form created out of a 956 shell. 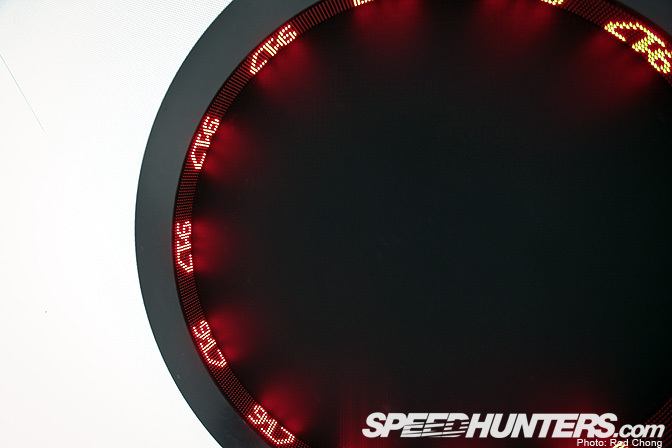 … and the LEDs light up showing you a Porsche model… then the sound of the car's engine fills your ears… pretty cool! 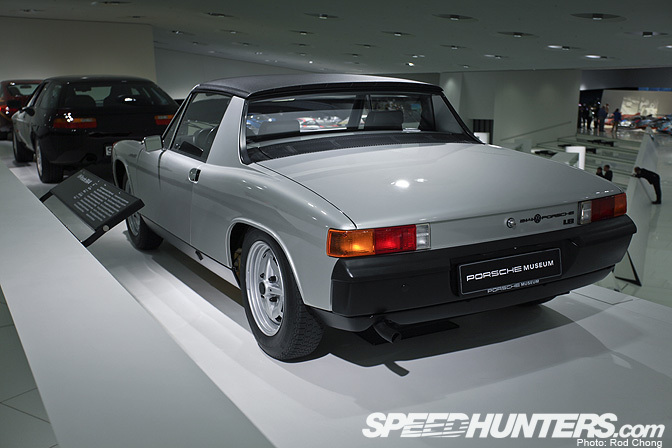 No visit to the Porsche museum would be complete without a shot of the 914. And here we have a one-off stretched 928 estate with full 2+2 seating. In some ways this is a bit of a predecessor to the Panamera. And that that comes the end of our tour. 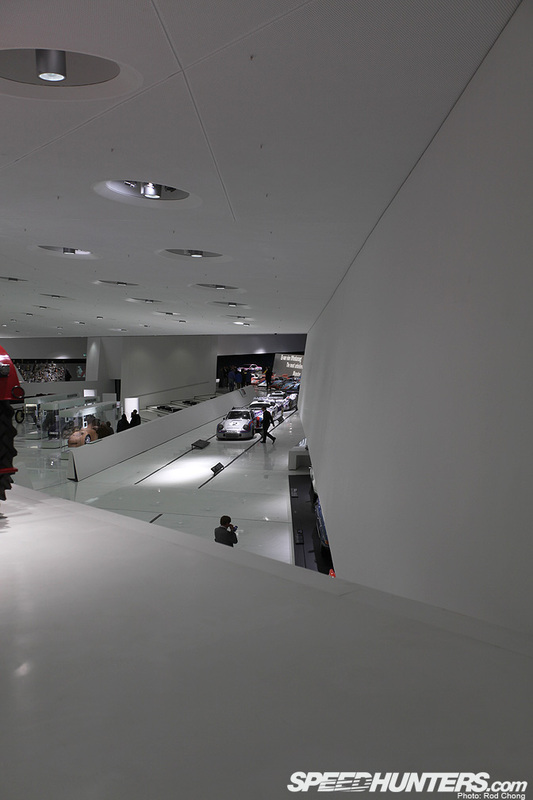 I hope you enjoyed this detailed look at the Porsche Museum! 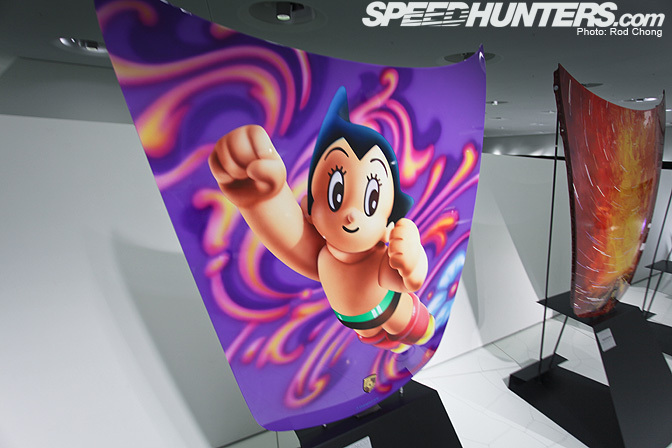 We will make sure to continue shoot these types of stories and will try to hit up more manufacturer musuems and private car collections in 2012. 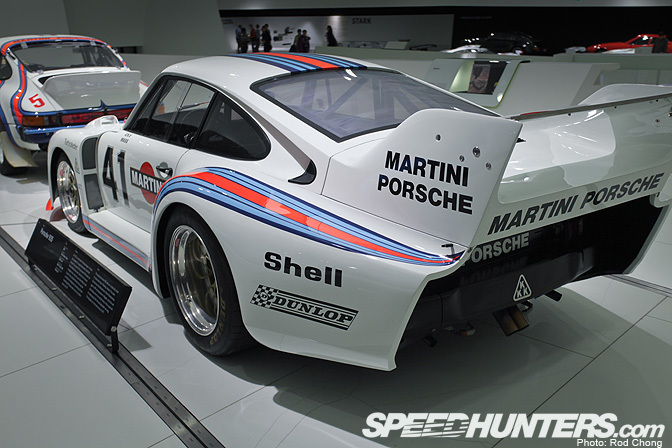 I guess you were at the museum during the Rensport meeting at Laguna Seca....so the 935/78 (real or replica) must have been the museum example. Strange they took off the awesome BBS wheel fans off though. Awesome!!!! Plain Awesome... just keep em coming ! 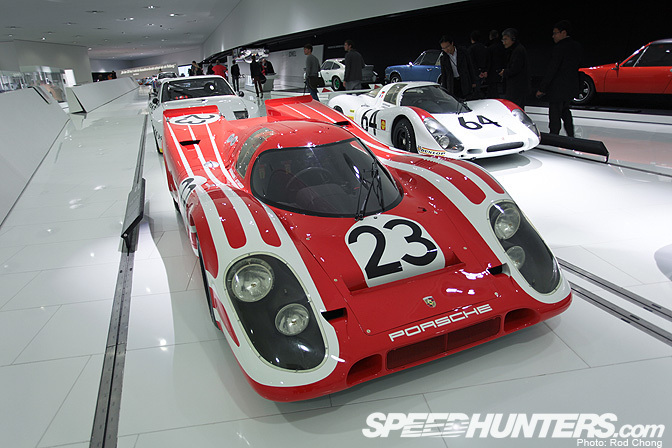 I wonder what top speed the Porsche 917/30 Can Am racer would hit if it was set up purely for a top speed run! It would have to smash the latest top speed road car records by a fair wack! Great feature. We're lucky enough here Down under that porsche bring a selectiuon of these cars out each year to do some parade laps in our Historic meets. We had the 935 and GT1 last year, two of my favourite Porkas. Keep them coming! Excellent tour! Thank you for hosting, Rod. 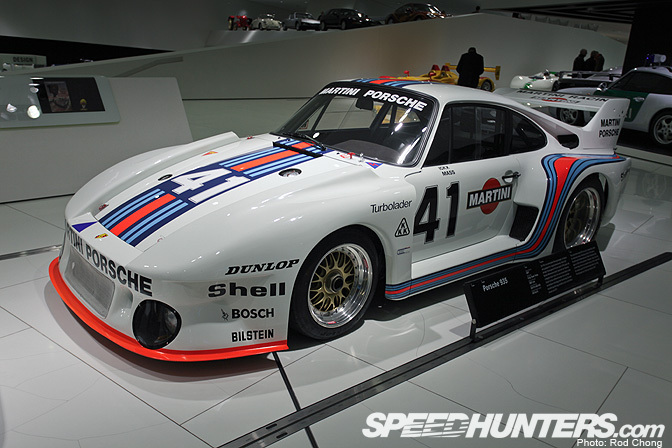 That isn't just a 935/77, it's a 'Baby' 935 with the 1.4l turbo. Wow. 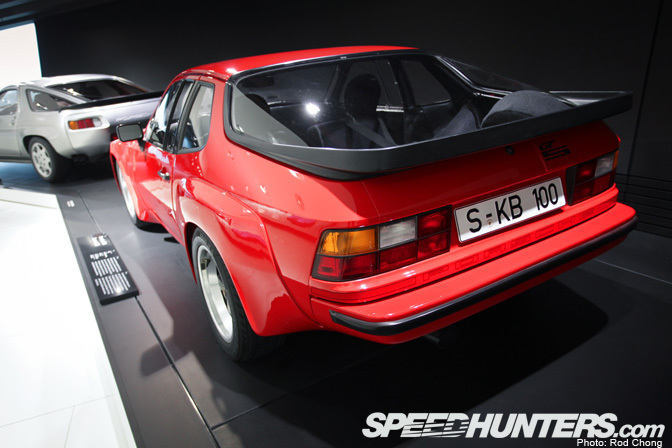 that 924 prototype is odd! Great collection and great shots. 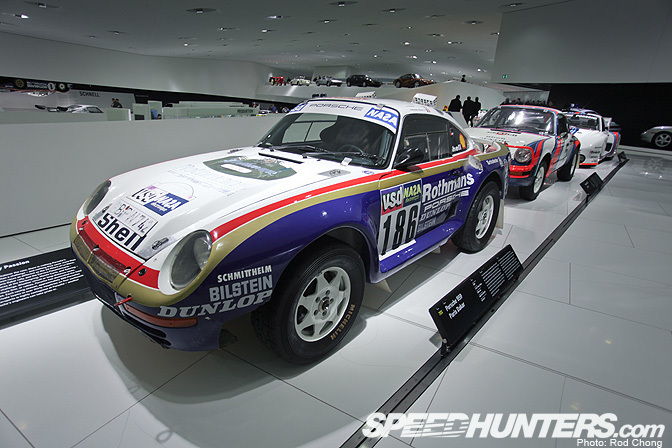 Were there any 934s there? That 935/77 is actually a 2.0L (1.4L with single turbo x 1.4 turbo equivalency factor) nicknamed Baby; the only one ever built and distinctly different from the normal 935/77 with the 2.8L motor that dominated Group 5 racing for most of the late 70s and early 80s. If I recall correctly, it only raced two races, finishing 6th in the first and 1st in the 2nd, and was developed to get Porsche more TV air-time because it ran in a different class than the 2.8 935/77. Many of these cars were shipped over to Laguna Seca for Rennsport IV (including this car as well as Moby D-i-c-k 935/78 of which there were only originally 2 built with customer versions later built). "one-off stretched 928 estate with full 2+2 seating"
that is by far my favourite porsche of all time.....in fact its my dream car :drool:!!! Amazing in every aspect. 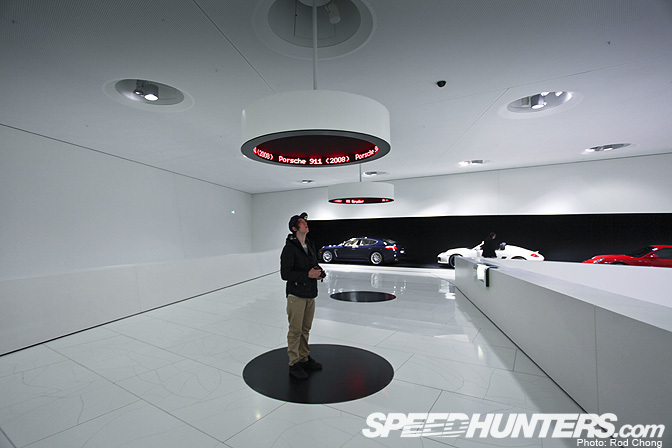 Wonderful photos and commentary, thanks to Rod and speedhunters. 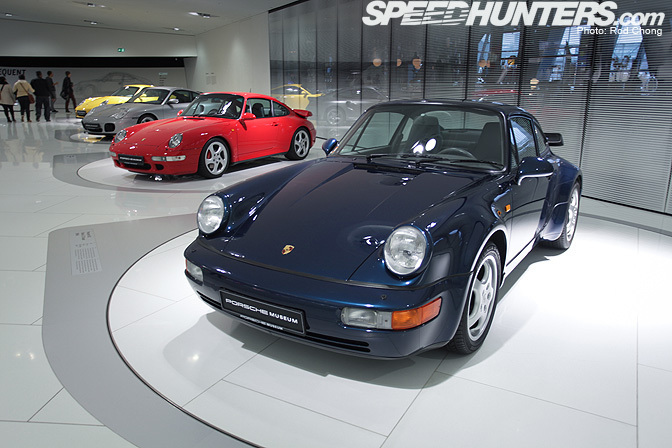 Yeah, that 993 Twin Turbo is sooo tame compared to those super awesome Rauh Welt things which look sooooooo menacing and then have a bone stock engine with a Tiptronic gearbox. How lame is that twin turbo 420bhp car compared to one with stupid wings and five foot wide rear tyres that would get beaten off the line by a labrador with a slight limp? 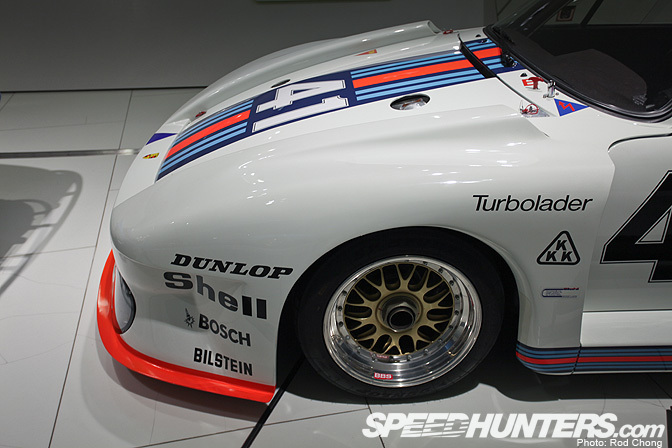 Really good post and ever get enough for a Porsche museum pictures. 911 Carrera RSR Turbo 2.1 is one of my favorite Porsche because it's so ugly that it looks fantastic. Geoff and Bradders. 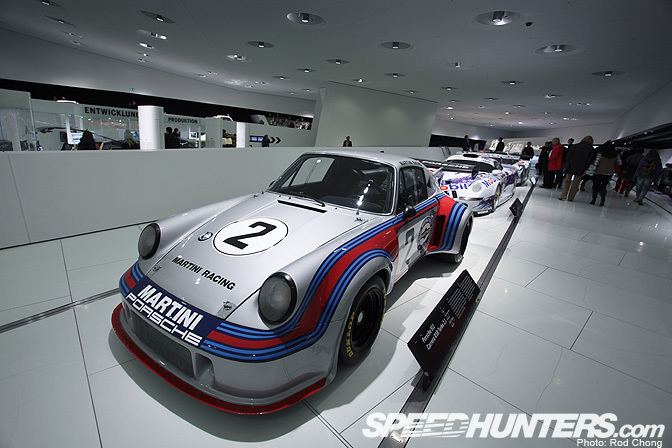 The 935 in the museum is not the Baby. The Baby has no front grill opening and the exhaust exits from the side of the car, behind the rear wheel. Great article! I have learnt something new of these cars. Thanks Rod!!! Fantasic shots....even more amazing cars! Great work! I'm so jealous you have no idea! As far as other collections are concerned, I'd suggest checking out the Nethercutt collection just north of LA, I visited it while on vacation last month, and wow! What a place! i NEED to do here before i die lol.